By and large, the company's growth has come from two streams -- market expansion in existing offices and acquisition. Oddly, not much has come from growth in property values. Consultant Victor Lund with WAV Group has worked with Howard Hanna (and others in this article) in the past, although none of these companies are currently clients. The title to this article may very well become the title of a book someday: The story of Howard Hanna’s ascension to the pinnacle of real estate brokerages in America is one for the Library of Congress. By and large, the company’s growth has come from two streams — market expansion in existing offices and acquisition. Oddly, not much has come from property value growth. I remember my early days in real estate. I was at a conference somewhere, and Alain Pinel was speaking about the growth of his namesake brokerage. When asked about his success, he replied along the lines of “When the doctors and lawyers are the poor people in your town, real estate is a great business.” It was a profound statement to take in. During the times of most rapid growth of Alain Pinel, Intero, and others in San Jose, property values were exploding in line with Silicon Valley job expansion and income expansion. Clearly, the marketplace in many areas of America is driving the growth of real estate brokerages. If your market share is steady but the property value grows double digits, your brokerage will see double-digit growth. In viewing the antithesis, when your market share is flat and home values go down, so does brokerage volume. It’s a factor of the old business lore that rising tides lift all boats. Like all brokerages, Howard Hanna has experienced extraordinary growth coming out of the recession — but it was not the market that did it. 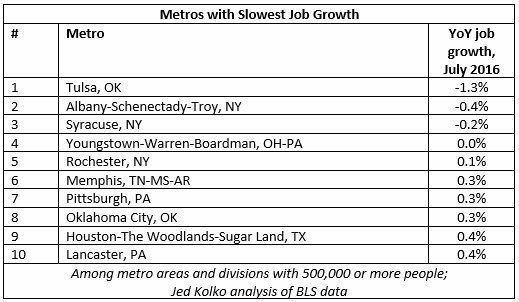 Take a look at this graph that shows metros with the slowest job growth in 2016. Howard Hanna’s growth was not just impacted by the rise in tide of property values. The company expanded its market share by purchasing companies and growing same store sales. Howard Hanna has offices across the regions of upstate New York and northern Pennsylvania that were highlighted as markets with lowest job growth. These adverse local economic problems did not seem to hinder Howard Hanna. Contrast this with NRT, the nation’s largest brokerage. NRT (and its parent company, Realogy) just took a hit during its last public reporting whereby it acknowledged that the franchise business was doing well, but company-owned NRT stores were underperforming. The market reacted negatively to the NRT report because it is concerned that NRT is not able to maintain or expand the companies it acquires. In truth, we do not know if Howard Hanna is really any better than NRT or Home Services of America at turning its business acquisitions into better brokerages. Home Services has been even more aggressive than Howard Hanna at acquiring brokerages. NRT acquisition activity has not been as heavy. I would not make any blanket judgments about the ability of Howard Hanna, NRT or Home Services to manage the companies they acquire any better than their competition. But I can say that Howard Hanna certainly knows how to make hay in many real estate markets that are economically challenged. Victor Lund is a founder of the real estate consulting firm WAV Group. Follow him onFacebook or LinkedIn.